Sami Al-Arian Released After 5.5 Years in Prison | Democracy Now! Sami Al-Arian’s eldest daughter. She is a freelance journalist living in Virginia. AMY GOODMAN: After more than five-and-a-half years behind bars, Palestinian professor and activist Sami Al-Arian has been released from prison. Immigration authorities released him on bail on Tuesday after they failed to explain his continued detention pending a trial for refusing to testify before a grand jury about a cluster of Muslim organizations in northern Virginia. 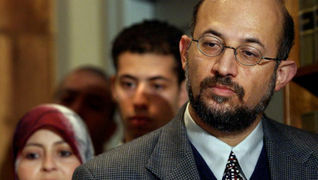 Al-Arian has been in prison since February 2003, when federal prosecutors charged him with being a leader of the group Palestinian Islamic Jihad. Two years ago, a Florida jury failed to return a single guilty verdict on any of the seventeen charges brought against him. Despite the jury’s findings, Al-Arian remained behind bars. He later struck a plea bargain and admitted to one of the remaining charges in exchange for being released and deported. His release date was set for April 2007, but as the date approached, he was imprisoned for an additional eighteen months for refusing to testify before the Virginia grand jury in a separate case. Since then, he has been on two hunger strikes to protest his imprisonment. Last week, Al-Arian’s attorneys filed a petition for habeas corpus with the court, challenging his continued detention by immigration authorities. The judge gave the government until Tuesday to respond. Their response came in the form of an order for Al-Arian’s release on bail. Four of his five children met him at the prison in Fairfax, Virginia yesterday afternoon. They were reunited for the first time in more than 2,000 days. But while he’s out of prison, Dr. Sami Al-Arian is not free. He must remain under house detention at his daughter Laila’s residence in Virginia pending trial. Laila Al-Arian joins us now on the telephone from Virginia. Welcome to Democracy Now!, Laila. LAILA AL-ARIAN: Thank you so much, Amy. AMY GOODMAN: It must be a very happy day in your house. Can you talk about the significance of your father’s release? LAILA AL-ARIAN: Absolutely. Well, it’s just — it feels very unbelievable and surreal that he’s finally with us after more than five-and-a-half years of being apart and of only being able to see him behind glass. It’s, you know, breathtaking, really. We heard the news yesterday morning and rushed to the immigration facility as soon as we got the phone call. And we gave him clothes to change into and took him home. And the whole time, we — me and my siblings just kept telling each other, “Is this a dream? Is this real?” We couldn’t believe it. And even when we first heard the news, we were a bit skeptical, because we’ve been in this situation so many times, where we thought my father would finally be released, and he wouldn’t. So we kind of held back our happiness and joy until he was finally with us. AMY GOODMAN: Can you talk about what led to his release after all of these years you have waited in the last — expecting him to be released over a year ago, over a year and a half ago? What was the final straw? LAILA AL-ARIAN: Well, I should start by actually saying that, you know, if it weren’t for the wonderful work of our attorneys — Jonathan Turley, P.J. Meitl and Will Olson — this really wouldn’t have happened. We owe so much to them. And what happened was, essentially, my father’s sentence ran out in April. He completed everything. After that, the charges came on criminal contempt because of the — especially of the efforts of a very vindictive and politically motivated prosecutor here in Virginia who is trying to basically ensnare my father in a new trial. So even though his sentence ran out, he was charged. But then there came a period where he was serving time in prison even though he wasn’t convicted of any crime. So, the immigration authorities had ninety days, according to the law, to either release my father or deport him, and they did neither. And our lawyers kept pushing to see where they were leaning. They basically said either release him or deport him; if you want to deport him, do it within these ninety days. Last week, they filed a petition for habeas corpus, which is something the Constitution guarantees anybody to be able to challenge their unlawful detention, and the judge gave the immigration authorities until Tuesday, which was yesterday, at 5:00 p.m. to respond. And since they essentially had no response, their decision was to release him, finally. AMY GOODMAN: Can you talk about what was said in court about whose custody your father, Professor Sami Al-Arian — used to be a professor at University of South Florida — whose custody he should be released into? LAILA AL-ARIAN: Well, on July 10, there was a bail hearing for my father, and the judge found that he was neither a flight risk nor a threat to any community. It was a very important order on behalf of the judge, a federal judge here in Virginia. And at that point, we thought that my father would be released sometime soon, but because he’s not a citizen, he was transferred into the authority of the Immigration and Customs Enforcement. They could have released him then and there, but they kept holding onto him, even longer than the ninety days that was allowed by law. And our lawyers at that point sent them at least seven different letters asking them what they were planning on doing. They never heard back until yesterday, when he was finally released. So, you know, we’re obviously very, very happy with that decision. AMY GOODMAN: Laila Al-Arian, you’re an author. You’re a journalist. You write for The Nation magazine, among other publications, wrote a book with the New York Times reporter Chris Hedges — former New York Times reporter. Can you talk about what the prosecutors argued about releasing him into your custody rather than your brother’s? LAILA AL-ARIAN: Right. Well, the same prosecutor I told you about who’s politically motivated, he’s made some extremely disturbing and racist comments about Arabs and Muslims in the past, such as “All Arabs lie,” which is something he told a jury in a separate — in another case. When our lawyer told the judge that the custody of my father be transferred from older brother Abdullah to me, the prosecutor actually got up in court in front of everybody there and said, “In this particular culture, women are not able to stand up to their fathers if they try to leave.” So this man was basically suggesting that because I’m a Muslim woman, I wouldn’t be able to basically have custody of my father. And everybody was appalled. I think mouths dropped all over the courtroom. There were gasps. And before our lawyer even had an opportunity to say anything, the judge interrupted him and said, “I got this covered.” And she was appalled at what was said and said, “This is not only an insult to Dr. Al-Arian and his father, this is an insult to the court.” And she automatically shot down that very racist and derogatory comment. AMY GOODMAN: So, saying that the — that your brother would have more sway over him than you would, because you’re a woman. LAILA AL-ARIAN: Exactly. I just think this particular prosecutor can’t help himself from having these racist outbursts. But obviously anybody who knows Muslim women or knows me, in particular, knows that that’s ridiculous. AMY GOODMAN: Who is this prosecutor? LAILA AL-ARIAN: His name is Gordon Kromberg, and he has a history, as I said, of making these types of statements. I think he’s made it really his career to go after a lot of Muslim leaders and Muslim organizations, particularly here in Virginia. And he was the one who actually brought my father from Florida to Virginia to begin trying to entrap him in a completely separate case. And what we’ve learned along the way, in his questioning of my father and in his attempts to charge my father with perjury or obstruction of justice by trying to force him to testify in a completely separate case, is that he’s not really interested in the truth. What he’s interested in really is retrying the case that the government lost so badly in Florida, and which is a clear case of double jeopardy and really trying to abuse the law by trying to re-litigate this case. And he’s even admitted this in his own filings and comments before the court in a public hearing. And obviously, we hope that these efforts are failing miserably. And I think the fact that my father has been released here in America is a very strong testament that he was never guilty of anything the government has accused him of and that he’s not a threat to anybody. AMY GOODMAN: Laila Al-Arian, your father is now under house detention pending trial. What trial is that, and where does deportation fit into this? LAILA AL-ARIAN: This is a trial on criminal contempt, as I mentioned, because my father would not testify. And I talked about this prosecutor not being interested in the truth. In fact, we offered for my father to take a lie detector test to answer the questions that were actually relevant to this separate case, this investigation of these Muslim organizations here in Virginia, and the prosecutor refused this lie detector, which shows that — and 99 percent of the time, it’s actually the government that asks for a defendant to take this test. So it just shows that what he’s interested in, really, is imprisoning my father by any means and that that’s what he’s after, not the truth, not justice. So, what we’re waiting for, basically, the judge delayed the trial until at least a few more months, while the Supreme Court considers an appeal we have concerning his plea agreement, which he signed with the government in 2006, and the fact that it’s a violation of his plea agreement to be forced to testify and cooperate with the government in the way that they want him to. So, pending the Supreme Court ruling, the trial has been suspended or postponed. What also has postponed the trial is that the judge is considering an argument that the same prosecutor has actually abused his authority once again by making up language in an immunity order, so when he actually brought my father to testify before a grand jury, he offered him an immunity order that usually prosecutors use the language that’s been passed by Congress — it’s a statute that Congress passed many years ago. But this particular prosecutor actually creates his own language and his own statute, and no other prosecutor in the country does this. It’s completely unprecedented. And I think more than one judge has been appalled at his kind of rogue behavior. So this is something that is also being considered by the court, whether this is constitutional or not. AMY GOODMAN: Your mother moved with your two younger siblings, your brother and sister, to Egypt. Could he be deported to Egypt? LAILA AL-ARIAN: He could be. We know that the Egyptian government has already accepted for him to be basically deported there and that he would be welcomed there as a citizen of the world, really, and as someone who can contribute so much to the entire world once this whole ordeal is over. And that’s what we really hope will happen at this point. We hope that within the next few months, this case will be seen as nothing but an attempt to really punish my father further than these five-and-a-half years and that he’ll be finally released and deported and this whole nightmare will be over. I think that’s what’s fair. That’s what people all over the country and all over the world have been asking for. And that’s really the only just way to end this whole nightmare that’s taken so long to be resolved. AMY GOODMAN: Laila Al-Arian, I want to thank you very much for being with us. Laila Al-Arian is a journalist in this country. She has co-written the book with Chris Hedges, Collateral Damage. Her father, Dr. Sami Al-Arian, has been released from prison in her custody after more than five-and-a-half years.